From the opening line (above) to the very end, it is impossible to put this children’s book down. Every page has some new development, and so we read one more chapter, then one more… This is a terrific children’s book. It takes a very familiar theme – someone trying to usurp a kingdom by trying to do away with the king — and turns it into a lovely fanciful story. 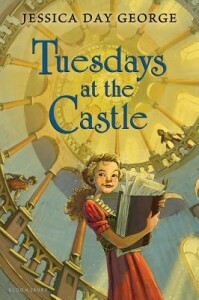 The drama is done very lightly, simply, and with the sweetest characters, including a castle that has a mind of its own. Therefore, this children’s book doesn’t have the same level of anxiety that others of this genre have (I think of The False Prince, for example.) That makes this book perfect for younger readers, even as young as 9. I particularly love the way the three royal children support each other fully. One is not more important than another, even though only one, Celie, has the power and connection with the living Castle. There’s a real sense of loyalty and family at work in their relationship. It is so heartening to find contemporary children’s books that are dramatic, humorous, well-written, yet without a trace of gore or graphic violence. While there are some bad guys in this story in order for there to be a drama, there are no horror scenes to make kids have bad dreams. This children’s book will do nothing of the sort, though it may make you wish you had a living castle on your side when things get rough!